MEOUG MAJLIS is the only platform in Middle East, for Oracle Users to Learn & Share. As an End User forum, MEOUG MAJLIS 2018 benefits users of entire stack of Oracle products to gain better value from their Oracle investments. Develop your network of contacts by interacting with Oracle customers, System Integrators, Consultants, developers and representatives from Oracle Corporation. Middle East Oracle User Group (MEOUG) an Independent User Group, will hold its Annual Conference - MAJLIS 2018 in Dubai. An exciting day of Oracle Roadmap, User Case Studies, SIG meetings and Round table. Attendees are expected from Middle East, Asia, US, UK & Europe. Atlantis’ signature Royal Bridge Suite, the most luxurious in the resort, measures in at 924 square metres and boasts floor-to-ceiling views of all of Dubai. 58,000km of steel bars were used in the construction of Atlantis, The Palm, which is approximately over 9 times the length of the Great Wall of China. Atlantis, The Palm is home to over 65,000 marine animals. The fish that call Atlantis, The Palm home, are fed 350 kilos of restaurant quality seafood including shrimp, krill, squid, jacks, sardines and other varieties of fish and romaine lettuce each day, meticulously prepared in the fish hospital. The viewing pane into the Ambassador Lagoon which holds 11 million litres of seawater is 10m long and 70cm thick. Aquaventure Waterpark can hold 5,000 people at one time in a single day. Employees of Atlantis make up to 3,000 people. The team represents 79 nationalities and speaks 68 different languages! The priceless Dale Chihuly sculpture in the Grand Lobby of Atlantis was created using 3,000 hand blown pieces individually placed to create a 10m high centrepiece. Atlantis’ celebrity chefs (Giorgio Locatelli, Nobu Matsuhisa, and Michel Rostang) hold 6 Michelin stars all together. The Atlantis team has more than 500 chefs serving over 15,000 meals per day. End users are IT professionals, namely CIOs, IT directors, IT managers, Application Managers, Oracle Consultants, DBAs among others from organizations that are licensed users of Oracle Products. These people are responsible for their organizations' own internal systems and will not provide services, advice, or products to other organizations. Proof of employment may be required to complete the validation process, such as the presentation of a valid business card, company security entrance card, and/or stationery featuring the company letterhead. If a person is employed by an IT Company, Oracle Partner, System Integrator, reseller, or consulting firm and does not operate as an internal systems specialist, this person will be viewed as a Vendor representative and must be a member of MEOUG to attend all our events. Examples include Marketing Managers, Sales and Business Development Personnel. Vendors/Partners can become member of MEOUG and gain access to community of Middle East Oracle Users/Customers. Duration: Valid for 1 year from start date of the membership, to be renewed every year. Events: Can attend all SIG Days and MEOUG MAJLIS Annual Conference. As attendance is limited for each event, all members must register for individual event & get confirmation to attend. Payment terms require that all delegate fees are due in full on registration. Excel4apps is the Gartner-featured provider of Excel-based real-time reporting, analytics and data-loading software for use with the Oracle E-Business Suite. Excel4apps’ solutions empower 1000s of business professionals globally, expediting accurate and timely business decisions. Innovate Tax bridges the gap between Oracle and Tax technology, translating complex tax rules into user-friendly and fully automated tax solutions. The complexity of the solution is made simple for users in our structured tax logic. In 2006, a group of Oracle executives with more than 80 years of combined experience in ERP reporting and business intelligence founded Orbit. They did so because they realized that something was wrong with most reporting and analytics applications. Effective management of Oracle E-Business Suite setup and key master data is essential. The complexity of the Oracle E-Business Suite, from both functional and technical perspectives, makes this a time consuming and costly process – and one that is highly prone to human error. TransSys Solutions is a fast-growing Oracle Cloud Select Platinum Partner with primary operations in Middle East & Africa and Development Centers in India. The company is focused on delivering transformational value to its customers through effective delivery of enterprise solutions. TransSys designs future ready solutions aimed at empowering companies to achieve greater heights in today’s challenging business environment. A hands-on event to explore Oracle’s new cloud services. No expertise required! Times are changing and things are getting simpler in the Cloud! At Oracle we have invested in delivering a plethora of new Cloud Services and we want to show you how simple – yet powerful they are. We want to showcase how simple they are for the IT and for the non-IT alike - and how powerful they are to be considered as serious tools that could help your organization take the right steps in transforming for the Digital era. We believe the best way to do this is to let you explore our cloud services, hands-on! We have prepared an event were we will give you access to a number of Oracle Cloud Services and have our experts guide you to “play around” with our tools and browse the screens, configure integrations, processes or develop applications. No expertise or experience required We will have experienced instructors guide you through the tool’s online screens and explain how each service works. There is no expertise required from your side, just bring a laptop with a modern web browser. What to bring? A laptop with a web browser. Oracle is committed to promoting a corporate culture that is centered on integrity, accountability and ethical business conduct. Michael Bonito - Territory Sales Manager, Excel4apps. With the introduction of VAT from January changes to your reporting doesn’t need to be a resource intensive, time-consuming and expensive exercise. Excel4apps’ products seamlessly integrate with Oracle E-Business Suite and allow the finance user to easily and securely build reports all within Excel. Easy access to data at a click of a button from Excel provides greater power to your users and the flexibility to quickly adapt to the new VAT landscape. This case study presents the integration done between Oracle ERP with one of the principal manufacturer's stock management system. This helps in supply forecasting and maintaining minimum stock level for ensuring no stock-outs, minimum inventory retention cost, seamless stock optimization across stores and also buyback of stocks by the vendor. 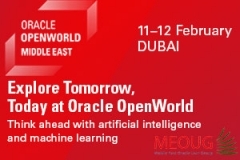 Me and the AI team from Oracle, will cover how Artificial Intelligence (AI) can be an important influence considering main factors like Tourism, Health, Education, and Commerce. Artificial Intelligence transformation has arrived much faster than we could have imagined. AI touches each and every aspect of life. How disrupted technologies like IoT, Block Chain, Machine Learning, RPA powered by AI, can help transform and enrich experience. Ebrahim K Kanoo B.S.C. (EKK), a sole automotive distributor of Toyota and Lexus has implemented Oracle e-Business Suite across all its business units. EKK also initiated a Business Intelligence project and went live with its first phase. With the objective of digital transformation, EKK is driving a mobility project to put up all customer oriented processes on mobile devices. We have seen substantial reduction in customer serving time in vehicle service center, very effective vehicle sales management and almost paperless process. Predictive analysis captures human experience, feedback, and knowledge after each step, forecast outcomes of an initiation based on the past trends, provide visibility to procurement knowledge scattered across various entities in the group and provide real-time suggestions and recommendations at key decision-making stages in supply chain cycle. The Presentation / Discussion should answer the following the questions Why the Importance of the business case has increased. How do we go about building the business case and what are the benefits of having a good Business case. Who are the recipients and who should prepare it . all CIO's , Head of IT , CFO who will be accountable for getting large Application and technology projects approved by the Board would benefit by this presentation. DevOps and Container Native Development are the key to fast deliver solutions to the business. During the presentation we will demonstrate our key services and how to efficiently realize CI/CD capabilities in the cloud. Oracle E-Business Suite is a powerful, complete suite of applications that can deliver tremendous value to organizations around the world. That value can be greatly extended when coupling it with Oracle Cloud offerings delivered by Oracle Infrastructure-as-a-Service (IaaS) and Platform-as-a-Service (PaaS). The purpose of this session is to understand the value proposition, the solutions offered and the use cases for Oracle E-Business Suite customers to deploy their environments on Oracle Cloud (IaaS and PaaS). As a current Oracle E-Business Suite customer, you want the confidence that your choice of integrated, global business applications will continue to enable your organization to make better decisions, reduce costs, and increase performance. In this session, hear from Oracle E-Business Suite General Manager Cliff Godwin as he delivers an update on the Oracle E-Business Suite product line. Cliff will also discuss the benefits you can expect to receive from both cloud and on-premises E-Business Suite investments. You will come away with an understanding of the value Oracle E-Business Suite applications deliver now and in the future.